I love to cook, but it is also important to me that the meals I serve my family are both nutritious and healthy. 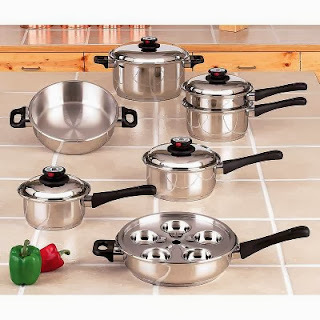 I have always been comfortable using stainless steel saucepans but when it came to frying something on the stove, I would often resort to nonstick. Now that I've started using stainless steel cookware more extensively, I wonder why I didn't make the transition earlier. In the late 1990s and early 2000's there were a lot of news reports showing that chemicals known as PFO's, PFOA's (perflurooctanoic acid)and PFC's were being released from the Teflon cookware into our bodies. There is evidence that this chemical has been linked to cancer in lab animals and may, in fact, have led to birth defects in DuPont employees. While DuPont, the main manufacturer and user of these chemicals, claims that these chemicals are safe, DuPont has paid out millions of dollars in compensation not only to their employees but also to the people living in the vicinity of the Parkensburg factory. Whether Teflon is completely safe to use in your home is still debatable, for even DuPont's own experts advise caution when using nonstick items, particularly at high temperatures. Studies indicate that a pan heated to 680 degree F. (which could take only minutes if a pan is left unattended to preheat) does release PFOA. Based on the growing health concerns about nonstick cookware, though it is initially cheaper to purchase, it may not be the best decision in the long run. 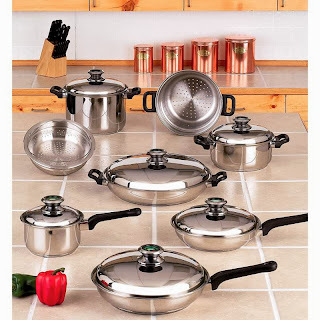 After researching both Teflon and stainless steel cookware, I was pleasantly surprised to learn that some of the criticisms of stainless steel cookware are unfounded. 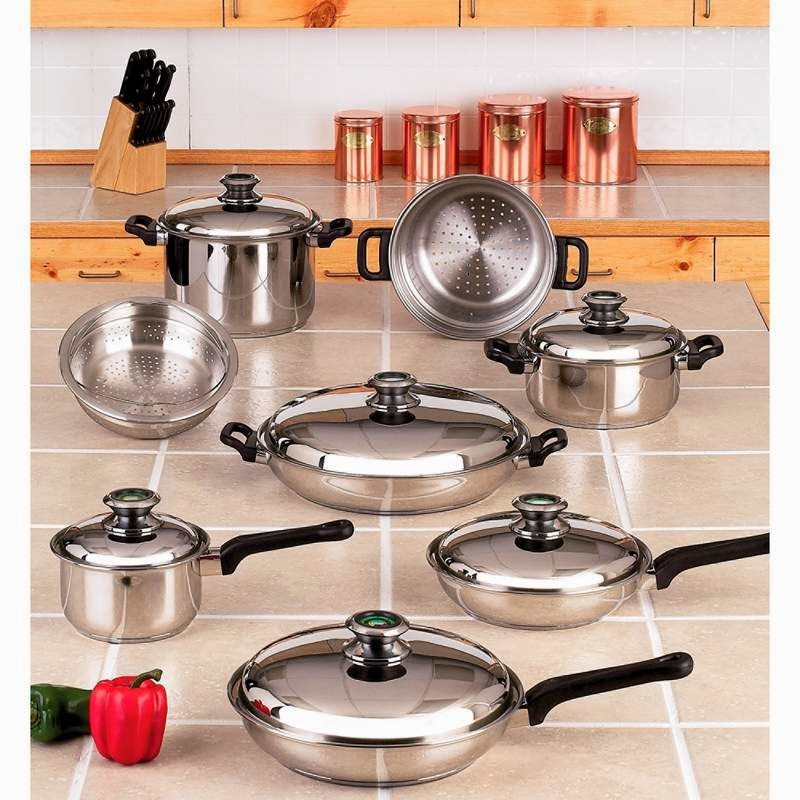 True, the initial cost of stainless cookware can be expensive, ranging in price from $300 to $2,500 for good quality stainless cookware. However, one should really consider it an investment that will last a lifetime with proper care. Stainless steel is noted for its durability and ability to resist food acids and alkaline foods as well. Steel is mixed with chromium and nickel to produce a corrosion-resistant steel that is scratch resistant and easy to clean. The better-quality stainless steel waterless cookware is 5-ply (304 surgical stainless steel, aluminum alloy (a bonding agent for heat transfer), pure aluminum for fast and even heat distribution, aluminum alloy acting as a bonding agent for heat transfer, and surgical stainless steel) or 7-ply (304 surgical stainless steel, carbon, 304 surgical stainless steel, aluminum alloy, pure aluminum, aluminum alloy, and AISI 430 stainless steel). These layers allow for even heat flow and durability. The aluminum conducts the heat well in the inner layers. However, it would not be good on the outer layer because it would corrode and enter our food. 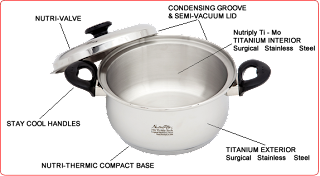 Stainless steel effectively protects the food and cookware. Many choose Teflon pans over stainless steel because they believe that nonstick pans are easier to clean up. However, cooking with stainless steel does not mean that foods have to stick in the pan. 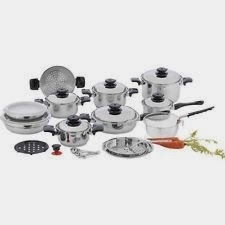 By using quality cookware and following simple directions, you can produce a great meal every time. Stainless steel cookware with the heavy multi-ply bottom provides an even heat that, if properly regulated, will not cause your food to stick. After preheating your pan on medium, simply put your pieces of meat or poultry in the pan, let them sear for 5 - 7 minutes on one side, then use tongs or a spatula to turn over and sear on the other side for the same time. If you try to turn your meat too early, it will stick. However, if you follow the above directions, the sticking is minimal and cleanup is easy. 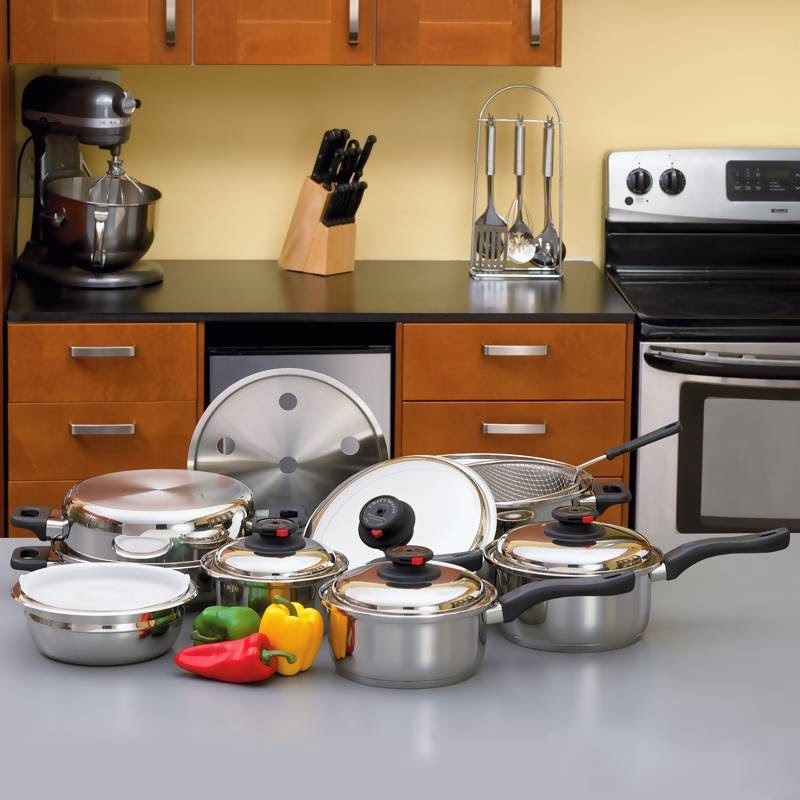 With stainless steel, most foods are cooked on low or medium heat. High heat is not recommended. You'll need to get to know your stove. Gas stoves allow for more heat control, but since there is so much variance among stoves, it is recommended to start out at the lower heat. 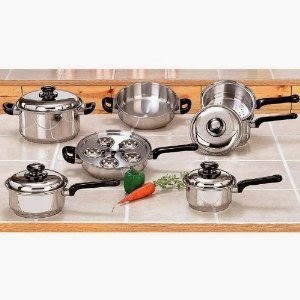 The waterless (steam-controlled) stainless steel cookware offers a whole new dimension to your cooking experience. Not only will your foods retain more flavors, but your foods will be healthier because they will retain 98% of their vitamins and minerals compared to the 58% retention rate of conventional cookware. Because foods are cooked in minimal water (the natural water contained in most foods provides enough moisture), there is minimal shrinkage. You'll definitely notice how the color, shape and taste of your food makes dining a truly pleasurable experience! Purchasing cookware can be a major investment! Therefore, before making that decision, spend some time researching your options. Weight the pros and cons of each and then make an informed decision. You may decide that you are more comfortable using Teflon and that's fine. However, if you have had your pots and pans for a while, check their surfaces. If they have scratches or are beginning to peel off, get rid of them! 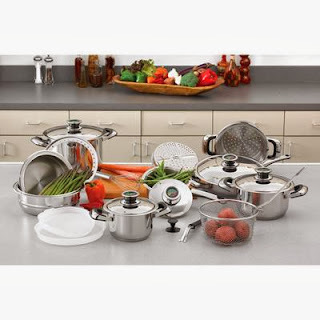 If you decide that you would like to try out stainless cookware, check out The Gourmets Cookware site for great deals on waterless stainless steel cookware, waterless cooking tips, and lots of healthy nutritional recipes to try! Marcia Klun is a former teacher and an experienced cook as well as the owner and webmaster of www.thegourmetscookware.com, a site that offers quality stainless steel products, such as waterless cookware sets, stockpots, cutlery, skillets, flatware, and other gourmet cooking essentials. 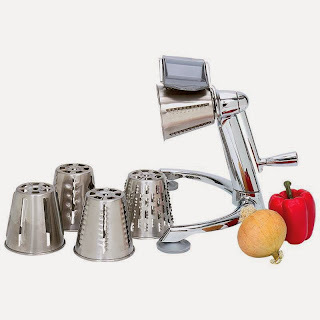 In addition, the site offers relevant information about waterless cooking and provides a variety of healthy recipes that can be adapted to waterless cookware.